I walked under grey skies, giving occasional rain but with rare splashes of weak sun, from Sole Street to Cobham. The footpath took off through grassy orchards to the Church. These held no veteran bramley, cox or russet, just neatly numbered rows of whips held up by beanpoles and wire. There were a few flocks of linnets and goldfinches that confounded the thought that the only living things in these plantings were the trees. 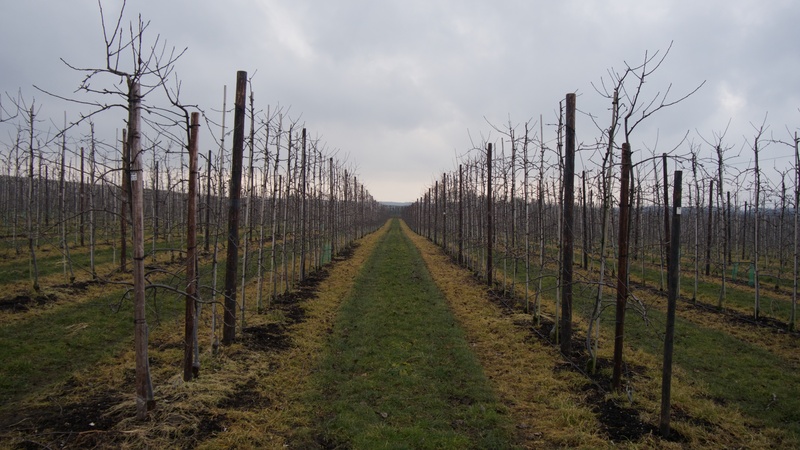 Modern orchard of twigs, grass and herbicide. In the graveyard, with its sad array of sodden bouquets, a stroppy mistle thrush held court in a hornbeam. It should have a nest by now in one of the taller trees. This is often built in plain sight, but I could not find it. On up to the church and past the back of New College of Cobham rebuilt for the poor and hence new in 1598. 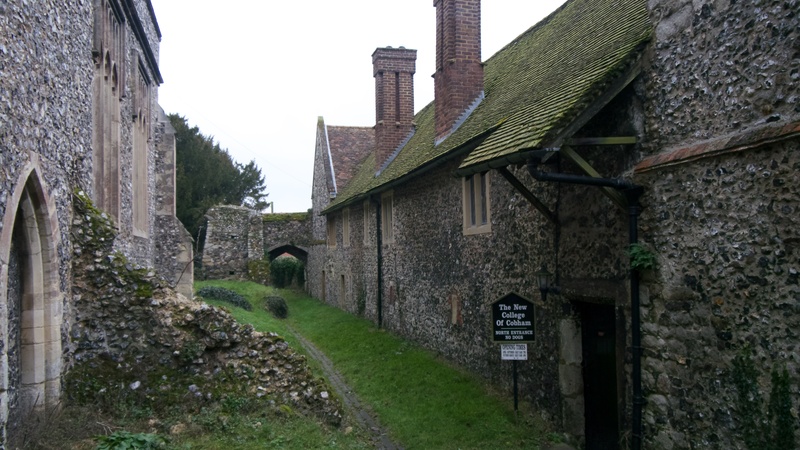 Priests were praying in the original College in Edward III’s time. The view down the narrow path gave a fleeting feel of a cold, cloistered life. Cobham village has a postcard pretty high street and a famous pub that Dickens often frequented,the name of which I could not remember. I walked east towards Cobham Hall and passed the Darnley Arms and the Ship and guessed, from the old brick, it was the latter but in fact I had missed it. The Leather Bottle was down the other way. Cobham Hall was carefully hidden by tall trees but the impressive avenue of young limes than ran north east for a mile from the edge of the village gave a hint that this was not your average detached. I headed due west aiming for the Darnley Mausoleum and eventually the track gave way to woodland. This was old and ancient with trees gnarled and holed. I hoped again for a lesser-spotted woodpecker but had to settle yet again for a great and a startled green that bounded out of the bracken with a strangled yelp. National Trust tree-fellers were at work with chain saws and talked loudly about where to cut, and where to drop, through bright hats, masks and plastic ear muffs. The fallen trees were not loaded or burnt but left to rot, presumably for the invertebrates to enjoy. Ancient hornbeam (Carpinus betulus) with lion’s face. At the top of the low hill, surrounded by old oaks and sweet chestnut, the Darnley Mausoleum has been restored. The old Earls may thank the mitigation arising from the Channel Rail Link, that runs just a mile or so to the north, for this resurrection. Before then it was a vandals’ favourite. Close up from the slope below, it looked carbuncular, plain ugly with its pimple of a pyramid atop pompous columns but, from away, it sat with some repose midst the tall trees. 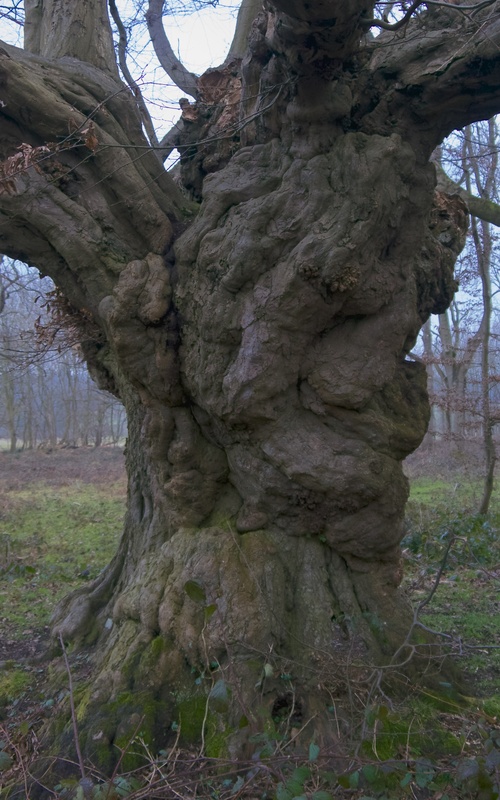 Cobham was medieval deer park before Humphry Repton worked it over in the early 19th Century and, like many estates with their carefully planted perspectives, now holds ancient trees with myriad rare beetles and bugs that no-one but a rare breed of ecologists ever see. This modern elite owes a debt of thanks to the old; it was the feudal system, given of god and kings, that permitted the landscape fashion to flourish and kept pleb, plough and harrow from the priceless acres. The weather turned wetter, the woods darkened and intimidated and birds stopped singing. I legged it without a glance backward through the strengthening wind.